What if the Garden Gal told you that by using one little bar of soap your skin could feel clean and your pores noticeably tighter without over-drying? Or that this amazing facial soap can also be used as a mask? And that the one bar works well on all skin types and typically lasts for a whole month of daily use… all for only $3.95? 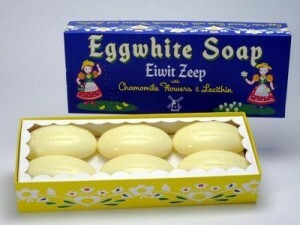 Meet the amazing egg white soap- pure, natural, and loved by people all over the world for more than a century. The benefits of egg whites are well-known for tightening skin, creating a healthy glow, and diminishing fine lines. The key ingredient is lecithin, a chemical component naturally found in egg whites that may actually help heal skin conditions and is recommended by some experts for treating psoriasis. 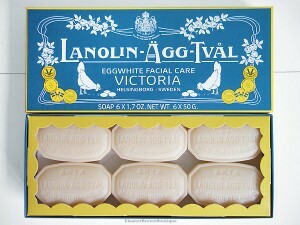 The original egg white soap, Lanolin-Agg-Tval, was created by the Swedish soap-makers Victoria in the early 1900s. A true original, the recipe is based on facial masks used by Swedish women over the centuries. 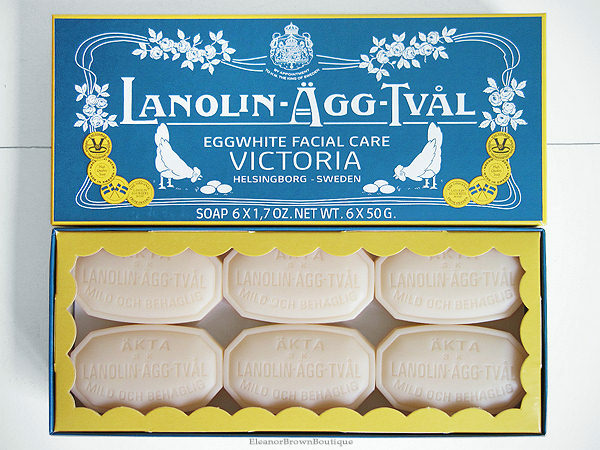 What makes Lanolin-Agg-Tval unique is that it combines the power of egg whites with the nourishing properties of lanolin and rosewater. Lanolin, one of the lipid-rich emollient class of moisturizers, locks existing moisture into the skin and also absorbs additional moisture from the air around it. Combined with rosewater, a naturally mild antiseptic recommended for acne and skin irritation, the skin is instantly nourished and hydrated. Our second soap, the Belgian Eggwhite ‘Eiwit Zeep’ Soap from Kala, shares the benefits of protein-rich egg whites but has taken out the lanolin and added chamomile flower oil to their unique recipe. Chamomile is known for its antiseptic and anti-inflammatory capabilities, which gently heal and soothe even the most sensitive skin. When used daily, both the Swedish and Belgian soaps will leave your skin with a rosy glow. As an extra treat once or twice a week, create a lather with the soap on the palm of your hand and generously apply to your face. Wait about five minutes and you will feel the tightening of the egg whites. Rinse off and you will see why faithful users describe it as a “mini-facelift”! Now for the moral of the story… each soap is beneficial in its own way and life is all about choices. So, go Swedish or go Belgian… either way your skin will thank you! To feel the difference for yourself, visit us at the store or order by phone at 651.293.1300 or 800.405.5545. Don’t forget to check out our website for other great products.